It’s been exactly a year since I brought you a free desktop download (see old download here). I’m extra inspired to design during the Fall, more than any other time of year. I’m going to try and be more consistent with the desktop giveaways. I hope you guys like this one. I’ve had this idea in my head for a long time, but couldn’t figure out how to execute it properly until today. Click here to download the graphic. 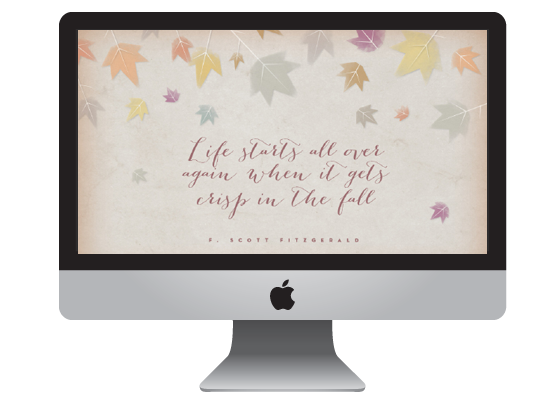 I used the quote “Life starts all over again when it gets crisp in the fall” by F. Scott Fitzgerald in the Great Gatsby. Enjoy the rest of your week! This is so beautiful and I love this quote. I agree Fall is so inspiring.